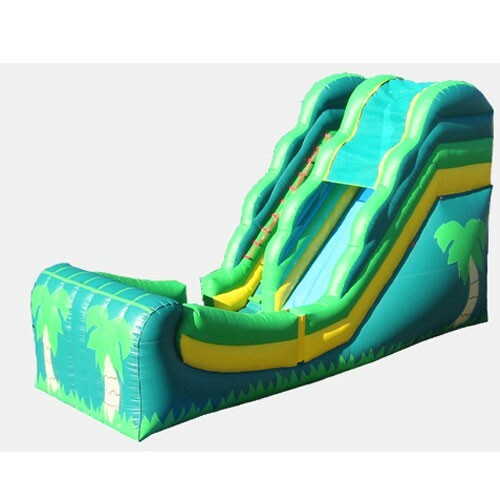 Ride the waves on our NEW Tropical Themed Wet and Dry Commercial Inflatable. This Wet and Dry Slide features a landing zone with a curved stop wall. This half-pipe inspired design gives the rider a new experience as they come to a gradual stop after sliding up the back wall. Designed with safety and year round fun in mind, you'll want at least one Wet and Dry in your fleet. This Commercial Grade Inflatable Slide is PERFECT for any Church, School, Rental Company or other institution! Features a one year warranty against manufacturer's deffects.